The Natural Death Centre takes an active interest in campaigns, discussions and debates on all aspects of death and dying. Some current subjects can be seen in this section of our website - see below for details. We welcomed the creation of The Charter for the Bereaved by the Institute of Cemetery and Crematorium Management, and encourage everyone to read this document and inform themselves of their rights with regard to burial and cremation. Access the Charter here. Historically the NDC has long been associated with the growth of green burial and environmentally friendly funerals and this continues to form part of our work, alongside the more general promotion of consumer choice and information. 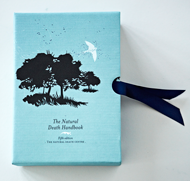 The charity has also always had an interest in increasing awareness of issues around death, dying and spirituality and this is very much reflected in the 'Writing on Death' book which forms part of the 5th Edition of The Natural Death Handbook. This may sound difficult and is in no way compulsory, but the simple presence of a caring person can bring comfort and a sense of safety and give an opportunity to remind the dying - and those left behind - of the achievements and struggles of an individual life. Spiritual themes and funeral ideas may emerge naturally during this time, it can be an extraordinarily rewarding time for both the dying and bereaved. These are people who sit with the dying professionally, but anyone can make a valuable contribution to another’s death. Some people may find Rituals - religious or not - to be helpful in containing and expressing spiritual needs. Some guides to these are included in the Resources list below. These are not uncommon and may include seeing loved ones or religious figures. These experiences can help overcome the fear of death and help to let go of the physical world and should always be respected. If we can avoid assuming that the dying are confused, we might share some of their joy. End-of-life experiences can also be shared by onlookers, not just by the person who is dying. Dying involves a merging of two worlds normally kept apart and witnessing this can be a great privilege. It is helpful not to have rigid expectations of what will happen at the end of life. Being present to a person’s dying is sometimes enough to help them and this can take different forms. If it is not possible to be with the dying physically, loving thoughts or prayers are often thought to be helpful. Are often available to lead a funeral when a traditional faith service is not appropriate. Celebrants can assist in creating a ceremony to fit with the spiritual beliefs of the dying person, they will usually discuss different options and should always encourage participation from the family and friends of the person who has died. Natural burial grounds are not generally consecrated, but graves can usually be blessed and many faith leaders are willing to do this. Becvar, Dorothy, In The Presence of Grief - Helping Family Members Resolving Death, Dying and Bereavement Issues. Hatanker, Jan, The Choice - Finding Life in the Face of Death, a therapist's case studies of encounters with death and of grief reconciliation, including her own. Hunniford, Gloria, Always With You - a very personal account of losing a daughter, with letters from the public illustrating the losses and survival of others too. 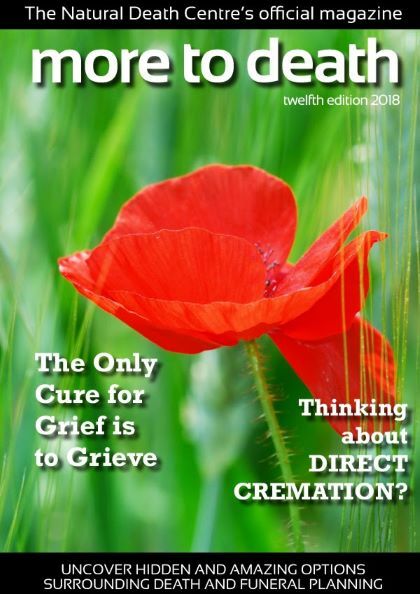 LaGrand, Louis, Messages and Miracles – Extraordinary experiences of the bereaved – well-documented accounts of experiences of after-death communications. Picardie, Ruth, Before I Say Goodbye, Penguin, 1998. Stedall, Jonathan, Where on Earth is Heaven - A personal journey that mirrors the remarkable upsurge of interest in spirituality today. Anderson, Megory, Sacred Dying - Creating rituals for embracing the end-of-life.